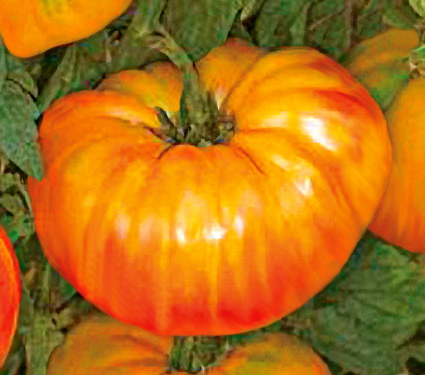 Named for its shape, not flavor, the Pineapple tomato is a bi-color beefsteak tomato. Its outer ribbing is reminiscent of a pineapple’s ribbed exterior. The tomato’s size, too, places it in the category of large tomatoes. Beauty. Pineapple is a very pretty fruit, with a beautiful streaked red and yellow exterior and interior kaleidoscope swirl of red, pink, orange, and yellow. It is a colorful addition to salads and sandwiches. Taste. Known for its excellent flavor particularly among bi-color tomatoes, Pineapple is mildly sweet with low acidity, somewhat fruity, and includes a hint of citrus. Its flavor improves towards end of season. Size. Pineapple tomatoes range from one pound to often more than two pounds in size. One seed producer says, “You may be safer holding them in two hands, rather than one.” Pineapple has become a valued slicing tomato. Fruit is meaty with few seeds. Ribbing. This variety is generally not grown for commercial sale, as its ribbing – for which it is also named – makes it difficult to cut to a uniform size. 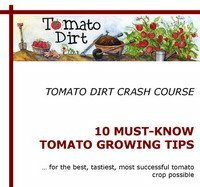 Look for these tomatoes in farmer’s markets or grow them yourself. Fruit set. Plant your patience along with your Pineapple seedlings when you place them in the ground. Not only is the variety a late season tomato, but its fruit takes longer to set than most other varieties. Stake it. As an indeterminate, Pineapple will continue to grow until frost but the variety is also among the taller tomatoes, often reaching 8 feet high or more. Stake your plants to encourage healthy growth and to prevent garden sprawl. Thin skin. Thin skin makes Pineapple susceptible to cracking in wet weather. While there isn’t much information as to the variety's origins, it is believed to originate in Kentucky – like many other bi-color tomatoes that hail from that state and surrounding southern Pennsylvania, Ohio, and West Virginia. This Belgian tomato, introduced by Pascal Moreau in 2005, is a cross between Pineapple and a black tomato. It yields heavy crops of 1 to 1 ½ pound round, dark-purple fruit with green shoulders. Interior color is a tie-dye like mix of pink, red, green yellow colors. Black Pineapple is loaded with rich, delicious, full-bodied flavors. Emerald green tomato with a touch of yellow originating in Ohio. It is noted for tropical aroma and flavors. Solid golden yellow-orange fruit, averaging 1 to 1 ½ pounds. Of all the Pineapple varieties, this one has the most distinctive pineapple flavor.